Epos has long had a reputation for producing attractively compact speakers with genuine audiophile appeal, and has managed to maintain this status through several changes in ownership. The company is now owned and operated by Mike Creek, and the speakers make natural partners with its high-quality affordable electronic components. 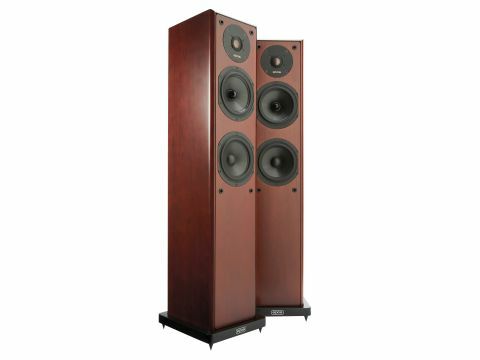 The £800-per-pair M16 is the latest addition to the range, and if the recipe looks quite familiar alongside the company's three other floorstanders, there are differences in the details that make it a logical addition to the roster. In a sense it's an upmarket variation on the ELS 303 configuration, at roughly double the price, but including some very pretty real-wood veneered cabinetwork and more advanced drivers based on those used in the M5 miniature. The adoption of two 135mm-frame drivers in a two-and-a-half-way configuration makes plenty of sense, over and above facilitating an attractively slim loudspeaker. The upper driver - fitted here with a bullet phase plug - should offer a smoother transition to the tweeter than a larger 165mm driver, while the lower driver, which has a conventional dust dome, is just used to double the effective cone area and add worthwhile bass reinforcement below 150Hz. In this case the bass-only driver is loaded by the bulk of the enclosure and a rear port, while the bass/mid unit operates in its own sealed sub-enclosure. Both cone drivers have 95mm moulded plastic cones, while the tweeter has a 25mm metal dome diaphragm. The very compact enclosure is beautifully finished in a very smooth, dark red stained-wood veneer, with elegantly radiused edges around the front and back panels. Light cherry and black ash are alternatives to our dark cherry pair. The whole enclosure sits within a black-painted plinth, which extends the spike footprint to ensure good physical stability. Three terminal pairs give full bi-/tri-wire/amp flexibility, which is nice, and the internal cable is DNM solid-core. The M16 is unquestionably nice to listen to, but while the broad midband is clear, even and well projected, it does rather dominate proceedings, and the sound quality is somewhat less impressive towards the upper and lower ends of the frequency band. The 45Hz port tuning frequency results in a less-than-ideal bass alignment, with slight 'one-note' tendencies along with a certain lack of harmonic richness. That said, this floorstander does have a slight advantage over the typical standmount in terms of bass weight and power, and drives the music along with some enthusiasm and gusto, even though serious authority is beyond its capabilities. Epos has established something of a tradition for models with a degree of restraint in the presence band, enabling the system to be played quite loud without becoming aggressive, but has the disadvantage that voices tend to sound a little 'shut in'. The M16 takes this rather further than most of its stablemates, resulting an overall sound that's essentially warm in character, albeit with some loss of vocal-band expression and some nasality, even though the treble proper supplies much of the necessary fine detail. This speaker is something of a paradox, as it sounds unfailingly polite and is therefore very pleasant and easy on the ears, but its essentially laid-back character doesn't really grab and hold the listener's attention as much as one might like.